CDN is welcoming you to take part in a series of trainings titled “Green Training and Green Policies”. It will consist of two activities, which will take place in Ukraine this autumn. We are planning to gather 25 young activists who have strong ties to or are willing to become a part of the Green Movement, coming from Ukraine, Moldova and Belarus. The deadline for submitting the application is 20th of August. Сеть сотрудничества и развития в Восточной Европе (CDN) рад пригласить Вас на серию тренингов “Зеленый тренинг” и “Зеленая политика”, которые пройдут в Украине этой осенью. Мы планируем объединить 25 молодых активистов, которые хотят стать частью Зеленого движения в России, Украине, Молдове и Беларуси (РУМБ регион). CDN is looking for prep-team members for the project consisting of two activities: “Green Training” and ”Greening Policy”. The activities are going to take place on 15-18 September and late November (weekend) 2017 in Ukraine. For details, check out the project page. After the series of events started in 2016 with the long-term goal to enhance the Green Movement in by developing the Green vision among the wider youth in the region, CDN continues with a new series of activities towards the same goal. By establishing a connection between young, Green-minded people and organisations in Ukraine and the RUMB (Russia, Ukraine, Moldova, Belarus) region, by deepening the understanding of Green values and connecting Green activism to Green politics, we are going to create a platform for young activists to examine the ways of influencing certain policies in an inclusive, green, and democratic manner in local and regional contexts. 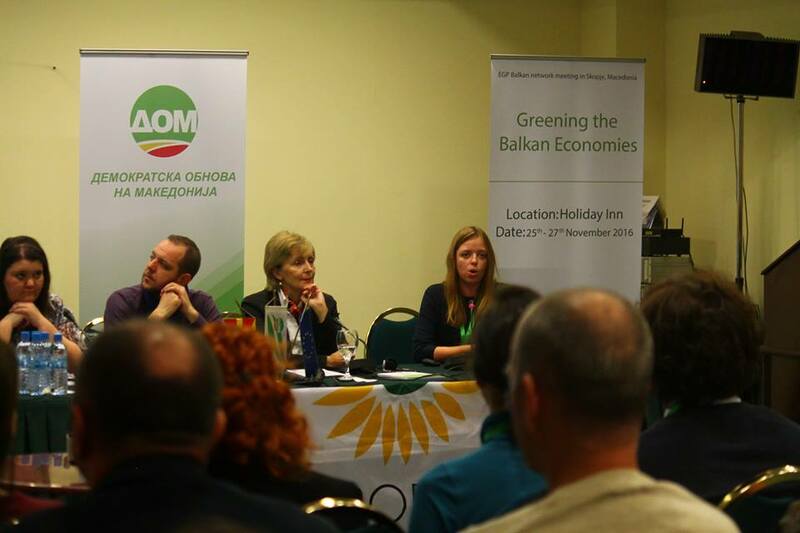 Last weekend the Balkan Network of the European Green Party (EGP) together with the local host, Democratic Renewal of Macedonia (DOM) organised a conference titled Greening the Balkan Economies in Skopje, Macedonia. Приглашаем вас принять участие в тренинге, посвященном Зеленым ценностям, который состоится 16-18 декабря в Киеве. 15 молодых людей из разных регионов Украины,а также их ровесники – гости из Беларуси, Молдовы и Евросоюза соберутся вместе, чтобы более тесно познакомиться с международным Зеленым движением и обсудить возможности сотрудничества. Рабочий язык мероприятия – русский, некоторые сессии будут на английском (в случае необходимости будет обеспечен перевод). From the 28th to 30th of October 2016 Cooperation and Development Network, together with the Georgian Young Greens organised a Caucasus Regional Meeting in Tbilisi, Georgia. The event gathered 25 green-minded activists coming from CDN Member and associated organisations from Armenia, Georgia and Azerbaijan.